On August 16 it is 25 years since Elvis Presley died. Still, Elvis is more alive today than ever. No one has more organized fans and Graceland is the most visited private home in the USA after the White House. Elvis records are selling like never before and this summer he has been number one in the charts [with the JXL remix of “A Little Less Conversation”]. 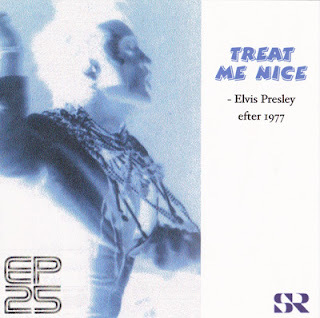 More about this can be heard in the program Treat Me Nice, where Thomas Melin takes a closer look at the phenomenon of Elvis. Listening to the program today (I have a copy of it on CD, of course), it hit me how much of what I included in it still holds true. Ernst Jorgensen is still searching for unreleased Elvis material and the demand for alternate takes, home recordings and live versions is as high as ever. Books about Elvis continues to be written and Elvis Week only seems to be getting bigger and bigger every year. And Elvis keeps performing “live on screen” accompanied by his old band members (although it might be for the last time during tonight's Elvis 35th Anniversary Concert in Memphis). At the end of the program, I asked Ernst Jorgensen how big he thought the interest in Elvis would be in another 25 years. His answer was that Elvis will probably sell fewer albums as the music gets older, but that he will not be forgotten. Ten years later, it is still great times to be an Elvis fan. The official collectors label Follow That Dream Records continues to serve us with unreleased material and their latest release, the book and 3 cd set A Boy From Tupelo : The Complete 1953-55 Recordings is truly remarkable. And then there is the Sony October release Prince From Another Planet 40th Anniversary Madison Square Garden 2 CD/1 DVD set to look forward to. On a completely different level, this marks my 500th post since I started the Elvis Today Blog exactly five years ago, on August 16, 2007. Something that would have never been possible without the support of my readers. To all of you I express my gratitude. But most of all, thank you Elvis, for always being there for me with your music. It means the world. With this post I'm taking an indefinite break from blogging. There is so much going on in my life at the moment, at the top of the list is my two year old daughter, I simply haven't got either the time or energy to write about Elvis. But I will continue to listen to the man who, like Troy Y. over at The Mystery Train Blog puts it so well, provides the soundtrack to my life. First and foremost, CONGRATULATIONS on your 500th post my friend! That is certainly an astounding accomplishment! I am saddened to hear that you are taking an indefinite break from blogging, however being the father of 3 children, I know exactly what you mean regarding having no time to sit down and write. Although we all love Elvis, I am happy to see that you have your priorities in order and are putting your family first! Besides, the time away from your blogging duties will only serve to provide you with some great ideas to write about when you are able to return! In the meantime my friend, cherish each and every moment with your family and THANK YOU for providing fans like me with such wonderful information, opinions and general entertainment! I am proud to be amongst your many readers, and look forward to your return to blogging soon!! Thomas, thank you for your many positive contributions to the Elvis world. Your blog is often an inspiration to me, and I feel it has helped lead me to become an even bigger Elvis fan since I first discovered it. Congratulations on 500 posts. Take care of your family, but don't forget to peek in on the rest of us from time-to-time. Stort tack för alla 500 bloggar! Thank you, guys, for your kind and understanding words. I have to admit I never imagined I would reach 500 posts when I started my blog in 2007, so that feels special. And it really means a lot to know that you have enjoyed what I've written. And before I sign off, I have to tell you that there will be an Elvis Today Blog Book Vol. 2. When that one is ready there will at least be a post about that. Your writings kept me good company on my daily search for good things to read & always made me even prouder of what I am...an Elvis fan ever since I saw the Aloha special live on tv when I was just 7 years old, looking forward to hear again from you when you'll have time, in the meantime... I'll remember you! thank you for your site. One of my favorites. Enjoy your child, its a very special time. Thomas: It's people like you that really make a difference in keeping Elvis' music alive for future generations to discover and enjoy. We fans will miss your blogs but know you'll always love and keep Elvis' music in your heart. Thank you again for your dedication and continual love for the King's music and the 'passing of his torch' to the future. Thank you so much for your kind words, Mike, they mean a lot to me! And I agree, it's truly amazing how many new releases we get from FTD each year.